I was talking to a group of my more artistic students about the section of “bible class” that I will be teaching next semester, about what I hoped to facilitate. See my post, Loose, for a bit of my inspiration. I was just hoping to expose them to some creative outlets and maybe even inlets for God to rush into, unobserved. I was just trying to give God His due with them, restore some wonder and wildness to their experience and understanding of Him. I was just trying to sanction off and protect space and time for God to come, unhindered by our structures and schedules and standards. I was just trying to make room for God in our busy, driven here and there lives …All I dreamed and dared was a place for us to rest in and with Him. But Jessica, saw it as more… a birth, a coming out of God, a coming out from within them… and importantly, His coming out in a way that they…each of them… could uniquely hold, handle and nurture. She saw the seed of God… central to their very person, blooming and bearing. I believe that this class is chrysalis time, that golden season, the literal derivation of the word, “chrysalis,” where the magic happens. Nothing is really added, but in this tender season, what has always been is transformed in a safe place – a place covered and sheltered, hidden in which glory resides and then flies free. 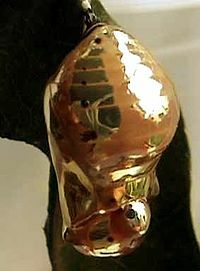 A chrysalis (Latin chrysallis, from Greek χρυσαλλίς = chrysallís, pl: chrysalides) or nympha is the pupal stage of butterflies. The term is derived from the metallic gold-colouration found in the pupae of many butterflies, referred to by the Greek term χρυσός (chrysós) for gold.